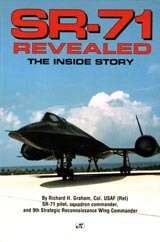 SR-71 Revealed: The Inside Story, by Richard H. Graham, Col., USAF (Ret) (biography), is the title of a book I wrote about the SR-71 Blackbird. By way of background, I was an SR-71 Blackbird pilot from 1974 until 1981. In 1981 I was selected to be the SR-71 Squadron Commander of the 1st SRS. In 1982 I was assigned to the Pentagon and returned to Beale AFB in 1986 as the 9th Vice Wing Commander. I was fortunate enough to be selected to be the 9th SRW Wing Commander in June of 1987 until November of 1988. I retired in 1989 after 25 years in the Air Force. The book includes many stories and tales from other Habus (SR-71 crews) to give the reader a well-rounded perspective of what we were all about, and how we lived and flew the SR-71. Below is a summary of my book. If you would like to leave me email about my book or the SR-71 program, feel free to drop me a line. Very few Air Force crews were fortunate enough to be chosen for the SR-71 program. Chapter 1 sets the stage for the beginning of my SR-71 career. Details of how SR-71 crews were selected for their flying skills and physical condition unfolds throughout Chapter 1. Over the years, Habus developed a close and special relationship with Lockheed, and other Technical Representatives ("Tech Reps"), who helped the Air Force maintain the highly sophisticated SR-71 and its unique intelligence sensors. The SR-71 simulator program was the most intense and nerve-racking training in the entire Air Force. Even the most experienced Habus left their egos behind every time they stepped into the "box." For every SR-71 flight that took place, there was another back-up crew, called the "mobile" crew, to take care of all the flight details and make sure each mission ran smoothly. Chapter 2 discusses the mobile crew's important duties performed before and during every SR-71 flight. To fly safely in the harsh, low-pressure environment of 80,000 feet, where outside temperatures reached -60 degrees Celcius and leading edges of the aircraft rose to +300 degrees Celcius from skin friction alone, crews were required to wear a full pressure suit. Chapter 3 gives the reader a first-hand account of what the pressure suit is all about and how it feels to be cocooned in one for hours on end. Fuel-thirsty SR-71s could not perform their missions without air refueling, and Chapter 4 explains just how important it was to have our own special tankers (the KC-135Q models) to perform that vital task! Chapter 5 delves briefly into the SR-71's roots--the A-12 and YF-12 family of aircraft. 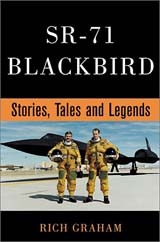 In Chapter 6, the technical features of the aircraft are discussed from an SR-71 crew member's point of view. 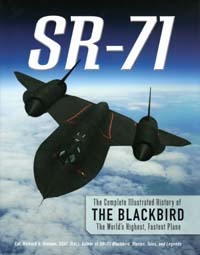 The peculiarities of our one and only SR-71 trainer aircraft, the "B" model, are covered in Chapter 7. The SR-71 flew two types of missions on a daily basis; training missions at Beale AFB in California, and our worldwide intelligence gathering missions, called "operational" sorties. All of our operational sorties were flown under the rules of Peacetime Aerial Reconnaissance (called PARPRO), specifically established for aerial reconnaissance during peacetime. The aircraft and crews were also "on the books" for a third reconnaissance mission in the event of a nuclear attack on the Soviet Union. All three of these missions are examined in Chapter 8. Home for the SR-71s and their crews was Beale AFB, located just outside the twin cities of Marysville and Yuba City, California. However, the majority of our operational missions were flown from other locations around the globe, called Detachments, or "Det" for short. The first SR-71 operational sortie was flown out of Det-1 at Kadena AB in Okinawa, Japan, in 1968, where they continued to be flown from until the program was terminated in 1989. Habus worked hard and played hard. Chapter 9 describes the Det flying environment on Okinawa and how Habus lived during their six week tours of duty on the island. In the mid-1970s we expanded our global reach and added RAF Mildenhall, in England, for flying operational missions. 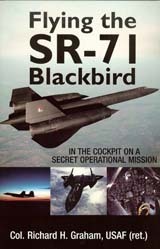 Chapter 10 takes the reader to RAF Mildenhall, where SR-71s were soon roaming the skies over Europe, gathering vital intelligence. In Chapter 11, an operational sortie is flown in detail from one of the Dets, giving the reader a cockpit perspective and vivid impression of the demands placed on flying the SR-71 at Mach 3. All the Habus were assigned to the 1st Strategic Reconnaissance Squadron (1st SRS) at Beale AFB. The squadron's traditions and rich heritage are covered in Chapter 12. Chapters 13 and 14 were the most difficult to write because of the deep emotion they evoke. They were dark days for Habus everywhere and emotions ran high as the program came to an end. My four-year tour in the Pentagon gave me deeper insights into the program's demise, and Chapter 13 explores these perceptions. Both chapters examine the final days of the SR-71 program, and why I believe a need for the SR-71 still exists today. After I returned to Beale in 1986, rumors were beginning to circulate about the possible retirement of the SR-71 fleet. From a 9th Wing Commander's perspective, Chapter 14 covers the tremendous amount of turmoil and uncertainty that took place between 1987 and 1989 as the SR-71 program came to an end. The political decision to terminate the SR-71 program, and those I believe primarily responsible, are further discussed in Chapter 14. The last squadron commander talks candidly about the final days of the squadron and how he preserved a small piece of our Habu legacy, traditions, and history. The three SR-71s given to NASA for use as a high altitude, high speed test bed are discussed in Chapter 14. In Chapter 15, Congress adds $100 million to the 1995 defense budget to bring back three SR-71s. In 1990, Senator Byrd and other influential members of Congress were told a successor to the SR-71 was being developed and that was why it was being retired. They subsequently discovered there is no successor to the SR-71 and that the aircraft is still needed to fill an intelligence void. Chpater 15 documents the return of the SR-71s. Through our Blackbird Reunions, held every two years, the Habu spirit will live forever, regardless of the outcome of the SR-71's return. Lastly, a tribute is paid to one of our most highly respected Habus, "JT" Vida, and to whom this book is dedicated. The book is 224 pages and includes 50 photographs. You can find it in your local bookstore or order it from them if it is not in stock. The book can also be ordered directly from my publisher, Motorbooks International Co., by calling 1-800-826-6600 and asking them for catalog number #122803AP. All royalties from the sale of this book are donated to the "J.T." Vida Memorial Fund (for more information click here).